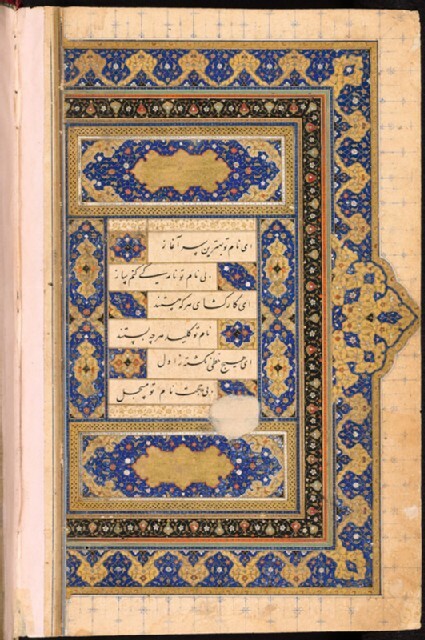 These two manuscripts [LI1487.1, LI1487.3] are vibrant examples of Islamic illumination. In both cases, a sumptuous double-page illuminated frame, known as sarlawh, highlights the beginning of the text. Similar ornamental devices indicating the transition from one section to another can be found elsewhere in the codex. A veritable tour de force for the artists involved in their design and realization, these fine and intricate decorations made use of the most precious pigments such as lapis lazuli, silver, and gold.